Relegated Sunderland will travel to Bury in the EFL Cup first round. Forest Green, promoted from the National League, will host MK Dons in their first appearance in the competition, while FA Cup giant-killers Lincoln will be away to Rotherham. The 35 ties will be played in the week commencing Monday, 7 August. Hull City and Middlesbrough have been handed a bye into the second round, having finished above Sunderland in the Premier League last season. There was confusion after the draw, which was streamed live from Bangkok, where the competition's new sponsors, energy drink company Carabao, are based. A list of fixtures displayed on the stream showed Charlton drawn against two clubs, while AFC Wimbledon were also wrongly recorded as being at home to Swindon - the Dons were drawn at home to Brentford, and Swindon will be away to Norwich. And Forest Green were listed as being away to Wolves, who were in fact drawn at home to Yeovil. The live stream was also hampered by sound problems, with listeners on some clubs' websites unable to hear the draw. The EFL have since released a statement apologising for "a number of third party technical issues that affected coverage of [Friday's] Carabao Cup round one draw in Bangkok". It continued: "There were inaccuracies - as a result of human error - in the live graphics output that resulted in confusion and incorrect ties being displayed on screen. "In addition, some users did experience difficulties in accessing the stream on certain external platforms. Both issues are currently under investigation. "The EFL can confirm that the draw was not compromised in any way and all clubs have received confirmation of their round one ties." There are 12 former League Cup winners in the first round, with five-time champions Aston Villa the most successful side entering at this stage, ahead of four-time winners Nottingham Forest. Villa have been handed an away tie at Colchester, while Forest host League One side Shrewsbury. Newport County were drawn at home to Southend United, but the match will take place at Southend's Roots Hall stadium so the Welsh club can finish work on their pitch. 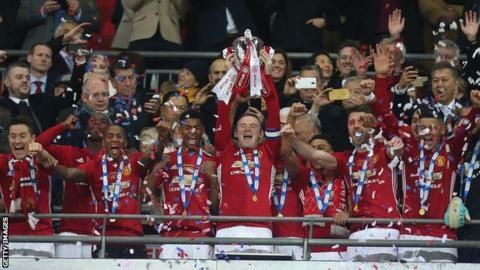 The final of this season's competition will take place at Wembley on Sunday, 25 February 2018.